Hearing loss in on the rise. 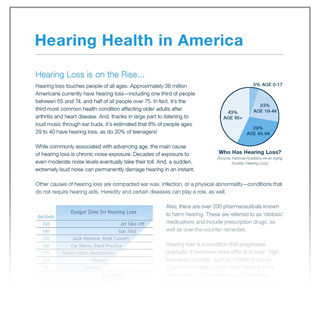 Approximately 38 million Americans suffer from hearing loss. Learn more in this special report. How loud is loud? Danger zone for hearing loss. What age does hearing loss begin for males and feamales? How do americans treat hearing loss? How does hearing loss increase the risk of dementia? Fill out the form and instantly download the free Hearing Health Report, right away.